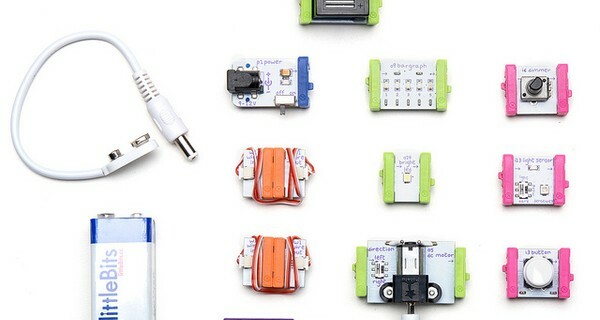 littleBits are small circuit-board building blocks that snap together with magnets – making it easy for everyone to experiment with electronics. The bits were the brainchild of MIT graduate and interactive artist and engineer, Ayah Bdeir, who says her aim was to democratise electronics, so schools, artists, museums and designers could dabble in circuitry just as easily as the experts can. ‘People today are in constant contact with technological devices, but most have little to no understanding of how they work,’ he says, and describes the toolkits as a way to ‘liberate’ people from being passive consumers of technology to being its active inventors. Each of the 37 colour-coded modules, aimed at anyone over eight years old, has a function built in, so you can make circuits of light, sound, pulse, button, and so on, without the need to wire, programme or soldier a single component and without needing to know how it works. To make a robot you’d need 14 modules, to build a lantern that flickers, just four. Bits come in nine kits: the base kit costs $99, premium $149, and deluxe $199. Another kit, developed with NASA, lets you build your own versions of devices and tech used by astronauts by combining LED displays, etc, with household items like foil and craft sticks. A special Synth Kit teachers older kids and adults about sound. Investors in the Greenwich Village based start-up, dubbed ‘Lego for the world of iPad’, include O’Reilly Alpha Tech, Joi Ito and Nicholas Negroponte. Kits have been sold to 80 countries, won more than 20 educational and tech awards and are in the permanent collection of MoMA. The source files about the bits are published in an open source library so if you do want to learn about electrical engineering you can see how they work, tweak the designs, and share designs and ideas with others.